Hyperthyroidism is a common endocrine disease that occurs in middle aged to older cats. It is the result of the thyroid gland producing too much thyroid hormone all the time, regardless of whether the body needs it or not. The thyroid hormone does many jobs in the body- it makes metabolism speed up, makes the heart faster, the blood vessels more responsive to adrenaline, increases body temperature, increases blood flow to the kidneys and gastrointestinal tract, and makes the liver work harder to use energy. All of these things are useful in small amounts, at the right time, but when they’re turned up all the way all the time, they can lead to many deleterious effects to various organs, including the brain, heart, muscles, liver, kidneys, and gastrointestinal tract. The symptoms of hyperthyroidism are: a ravenous appetite, hyperactivity, and weight loss. However, a small percentage of hyperthyroid cats will actually have a decreased appetite as well as a decreased energy level. This is called “apathetic hyperthyroidism.” This can make cats look and act very sick, but their condition will improve once their hyperthyroidism is treated. 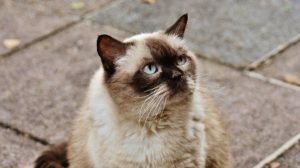 Hyperthyroid cats can also show symptoms if one of their organs is especially affected by the high thyroid levels, like the heart or the liver. What all of this means is that symptoms of hyperthyroidism can vary widely in cats. The good news, though, is that your vet can diagnose the condition with a blood test. Other tests to see if the heart or other organs (kidneys, liver) are adversely affected by the hyperthyroidism are also performed at the same time. There are 4 main treatments for hyperthyroidism: oral methimazole pills, a transdermal form of methimazole, the Hill’s y/d diet, or radioactive iodine treatment. Most cats start their treatment with oral methimazole, but specific medical needs and individual patient needs vary.